Do You Want “Allahu Akbar” Prayed Over Your Inhumanely Processed Beef? Further to the information below, at the bottom of this link ‘s page is updated Sharia Law Halal product information so that you can “Speak with Your Wallet” at the grocery store. I have asked the major grocery stores for information about Halal products in their stores which will be shared as it becomes available. 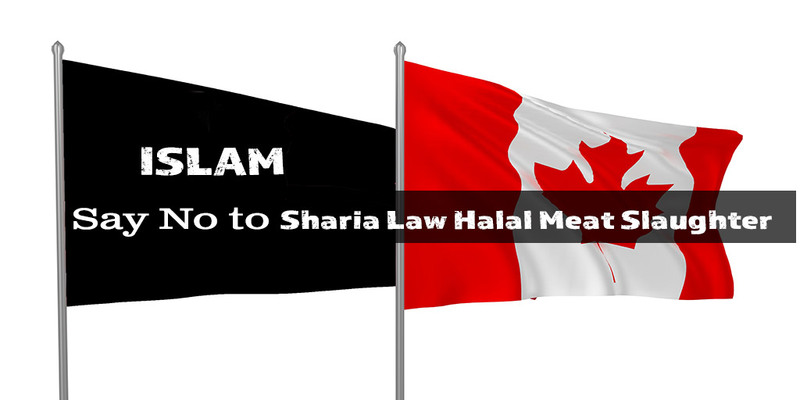 Update Oct 1, 2018: The “Islamic Society of North American” called “ISNA” is a worldwide authority over Islamic Sharia Law Halal meat production. Thanks to a Global News reporter named Stewart Bell, we learned it had its charitable status revoked by Revenue Canada because it was issuing receipts for an organization associated with funding Islamic terrorism – an organization the US has named a terrorist organization. Click here for a current list of Canadian Halal meat processing plants that are certified by the “ISNA”. 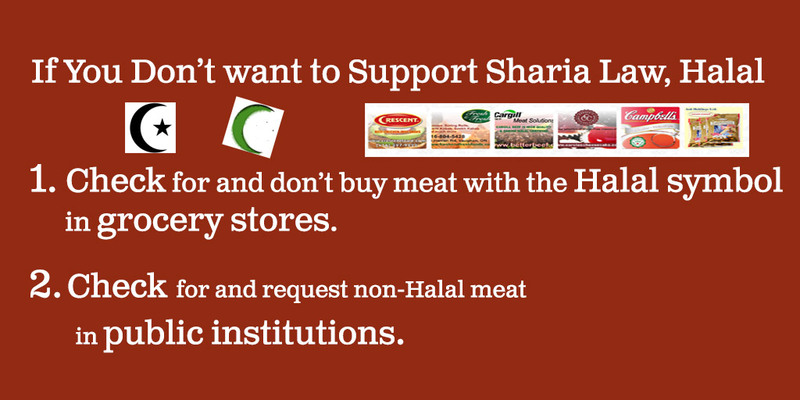 If you don’t want to support Islamic Sharia Law, Halal slaughtered meat, check with your grocery store and ask if the meat in its counter is Halal because it may not be labelled Halal. This list of Halal plants may be helpful to you in talking to your grocery store. Note that “Cargill Canada” is a meat processing plant supplier that produces about 30% of Canadian beef that is 100% Halal. Also, check for and request non-Halal at public institutions, like U of T and UBC. Many countries have banned the Sharia Law Halal slaughter method of animals because of its is inhumane treatment of animals. Also, for people of different faiths, or no faith, they may not want an Islamic prayer said over their food products, especially if they are not clearly advised that this may be the case. Below this video is an earlier video that is more about the process of Halal slaughter. Note that it does include descriptions of Halal slaughter that may be upsetting. [Cargill’s Guelph, Ontario facility] is 100% Halal and produces about 1/2 of Cargill’s beef processing in Canada. PM Trudeau visits the Islamic Society of North America “ISNA“, a major Halal Meat Inspector in Canada. ISNA in the US is an “Unindicted Co-Conspirator” in a terror funding trial. The Canadian ISNA (see update above) recently had their wrist slapped by Revenue Canada for indirectly funding terrorism. 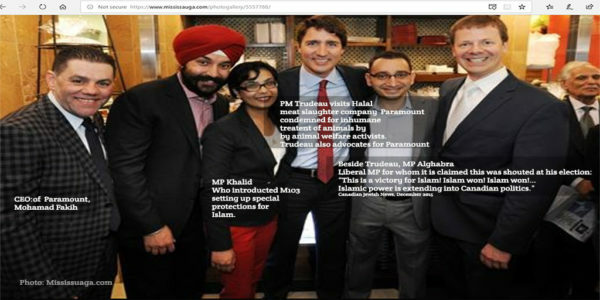 PM Trudeau is also, believe it or not, a spokesperson for Paramount which is a Sharia Law meat supplier, restaurant chain based in Canada. 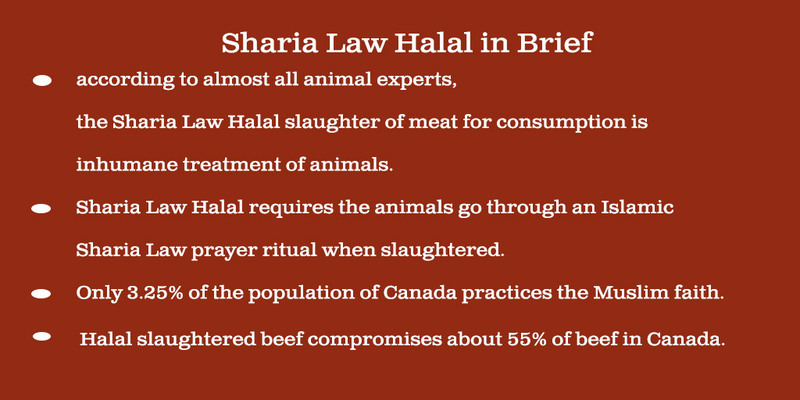 This entry was posted in Halal Islamic Sharia Law, Islamic Activism, Sharia Law in Canada, Religious Freedom and Christianity, Think Over News, Videos and tagged beef, canada, chicken, halal, is halal inhumane treatment of animals, sharia law, uk, what is halal.